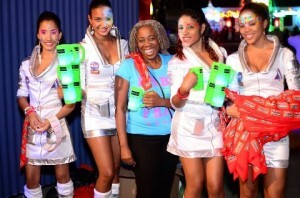 Tuesday March 6; Kingston Jamaica: Last Friday's 'Martian Dust Up', the second instalment in Bacchanal Jamaica’s Future Shock series saw all revellers out in full company, ready to take the intergalactic ride known as Kes The Band. Courtesy of Appleton Rum Special, Kes the Band took all 'Bacchanalist' and 'Baddists' to another Bacchanal dimension, where the “music sweeter than the rum, and the rum cyan dun!” The national rum of everything Carnival, Appleton, also ensured that patrons were well fuelled for the Out-of-this-World ride with its $1000 Bottomless Appleton Mug Madness and by giving away free drinks and mugs to the first 250 patrons, while another thousand patrons received, rags and light-up ice cubes which glowed all around the Martian surface. With excitement in the air as thick as Martian dust, the night was off to an excellent start. The cosmic Appleton promo girls “took it down to the ground” on the main stage, getting the crowd pumped; while DJ Smoke of Renaissance kept the revellers in motion, jumping and gyrating with his crazy selection of Soca hits. Also occupying the stage was Dust Up's MC, Fame FM’s Vybes Queen, Lady Rennae, who kept the crowd on high alert, teasing them with promises of Kes until they couldn’t wait any longer. Then finally, at midnight, in a burst of interstellar smoke, the real show began. Opening up with Precision Whine the Kes dancers launched on to the stage. Whining and gyrating in their bright costumes the trio got the crowd into a frenzy as they awaited Kes’ front man and Soca Commander Kes Dieffenthaller to take the stage. Kes the Band did not disappoint, giving the revellers the ride of their lives with their hits like ‘Where Yuh From’, ‘Stress Away’, ‘Ah Ting’ and “Coming Over”. They also covered crowd favourites 'Bacchanalist' and 'Palance' and had the crowd whining down low, and coming back up slow. But getting the crowd pumped was not enough for Kes; as true Soca warriors, they had to take it back old school with covers of classic Soca songs like ‘Iwer Butterfly Shadow Wave’, ‘Jump and Wave’ and ‘Tay Lay Lay’. Then they calmed down the crowd with a slowed version of ‘Palance’, just to mix it up with an entire new genre of what they call Island Pop. Soca infused dance music rang through the air, as Kes who had announced that they do music from every genre for everybody, started their covers of club hits like Usher’s ‘Without You’, Pitbull and Neyo’s ‘Tonight’ and LMFAO’s ‘Party Rock’, which took the patrons to a whole new level! And as no Kes show would be complete without the theatrics the Soca Commander is known for, a shirtless Kes jumped off the stage and ran through the frenzied crowd, commandeering a raised camera platform where he performed ‘Precision Wine’ and ‘Where Yuh From’ to the cheers of his ‘Wotless’ troupes. He then made his way back to the stage where the Band ended the show on a high note, while he waved a Jamaican and Trinidadian flag together. As the Band began to exit the stage, the Wotless patrons called them back for an encore. Kes the Band strummed up their instruments one last time, as the 'Bacchanalists' sang and danced, Appleton in hand, to their theme song, ‘Wotless’! “After a high energy Carnival in Trinidad, Jamaica really is a good follow up. The energy is so unique, so fresh, it feels great! I love Jamaica so much. And I thank Appleton for making all a this possible!” said the Band's front man, Kes, shortly after they left the stage. Kes The Band, who had been drinking nothing but Appleton Rum from the night before at Macau’s Bar, were headed to get their Appleton on again at the after-party at the Fiction lounge. Marketing Manager for Rums at Wray & Nephew, Cecil Smith, expressed that Appleton has had a beautiful partnership with Bacchanal Jamaica, sponsoring them for over 10 years: “Seeing the revellers having a good time, responsibly, while drinking Appleton, is one of the best things about our partnership over the years.” he said.